Heard of Facebook? Maybe once or twice? If you’re not one of the 1.79 billion active monthly users, you know someone who is. 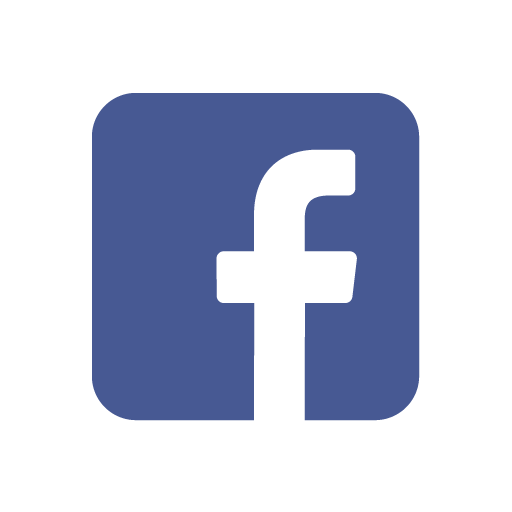 Facebook isn’t just a social media site though, it owns several other companies, most notably Instagram and Oculus VR, the leading virtual reality company. The company also has an employee satisfaction rate of 96%, higher than any other tech company (Google comes in second at 89%). So how do you get to be one of its 15,724 employees? Internships are a great way to introduce a company to your skill set. Hyla Wallis, Facebook’s university lead, claims internships are heavily used as an evaluation period for future positions. Average salaries are nothing to scoff at either, with intern reported compensation to be $7,800 a month for summer internships (granted, that’s almost an imperative for the expensive living in Silicon Valley). Take a look at cultural awareness essay paper to explore the positions available;. unsurprisingly there’s a tech emphasis, with 31 open positions solely within virtual reality working on Oculus Rift. Don’t panic yet though, business majors – there are opportunities available for you too, though 3 of 8 currently available business internships are specifically for MBA students. Although Facebook doesn’t release numbers on the amount of applicants for jobs, another comparable tech giant, Google, sees tens of thousands of applications and has an internship acceptance rate of 3.7% – so it’s safe to assume it’s a competitive applicant pool. Carlos Bueno, a former engineer at Facebook, recommends reading this post about getting a job with Google to prepare yourself for a Facebook interview. Bueno also wrote this piece that breaks down the key qualities that the company searches for in applicants. Fit: The ability to mesh with the company culture. Be able to understand and explain complex ideas, and be enthusiastic, motivated, and curious. Generalism: To be well versed in multiple areas of coding. While it’s great to be a specialist, many times engineers will spend a year working on photos and then the next year on the messaging app. Architecture: The ability to see the big picture and not get fixated on one part of the problem. Visualize the entire space of the problem. Coding Skill: The coding problems presented will be simple enough to explain in a few minutes, and solvable within 10 to 30 minutes, but will also require knowledge, skill, and concentration. Many people that are found online by recruiters to apply for positions have accomplished an impressive engineering feat, such as creating a successful app of their own, or winning a coding competition. However, if you’re the type that likes to expose flaws in apps, make sure they aren’t Facebook’s apps. Aran Khanna, a Harvard student, was lined up for a summer internship with Facebook when he found a way to breach privacy in the Messenger app. Khanna thought he would be praised for embracing the “hacker culture” but Facebook demanded that he remove the app he created, and his internship was revoked. According to Payscale, Facebook has the highest early career median pay of any tech company, with compensation at $116,800. That’s a whole $6,000 per annum (or 5%) over the next-highest tech company, LinkedIn, with $110,800, and 28% greater than Apple’s $91,300. A whopping 75% of Facebook employees believe that they’re being paid fairly, compared to 57% of employees at similarly sized countries. 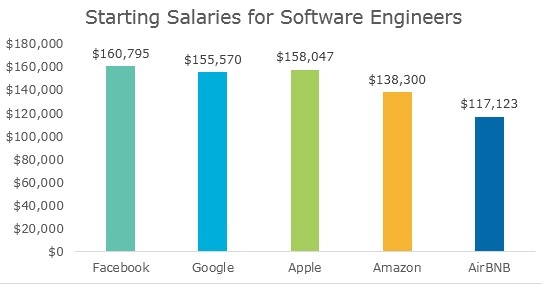 Starting compensation at Facebook for software engineers is also larger than other popular tech companies. The Facebook workspace has been described as a “college campus on steroids”. There are ice cream shops, bike paths, and the company even holds dodgeball tournaments. It’s hard to find employee complaints, but someone criticized that there was too much free food and that was causing them to gain weight. 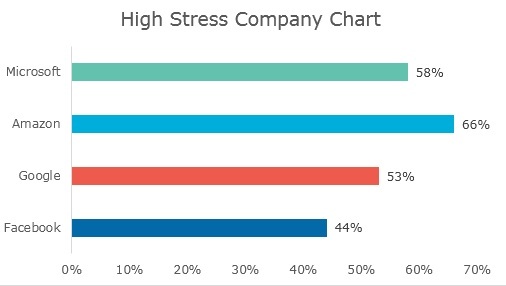 No wonder Facebook employees have the lowest stress level of any major tech company, with only 44% claiming high job stress. Employees are also extremely satisfied, with a 96% career satisfaction rate. Google, consistently ranked the best company to work for, falls 7 points behind at 89% career satisfaction. Despite this extremely high satisfaction rate, Facebook isn’t for everyone. Some people feel that the environment is too open, and that the company would operate better with more designated working spaces or a clearer work/life balance. Facebook is a top contender for the best employer in the country. With great perks, competitive compensation, and a 98% approval rating of CEO Mark Zuckerberg, the company soars above most large companies for attractiveness to talent. Bottom line: if you’re looking to work in tech, Facebook should be near the top of your list. Check out our company guides on tech giants, Facebook and Uber, to help you decide which company is the best fit for you. Looking for more career advice? TransparentCareer offers free data on compensation, career paths, and salary negotiation. Get paid what you’re worth! Sign up for free here.